Disclosure: This a professional review site that receives compensation from the companies whose products we review. Hello and welcome to my Guitar Tricks review. If you’ve been considering online guitar lessons you might have heard of guitar tricks and might be wondering if it’s worth checking out. O.k. let’s get straight into it. Who is Guitar Tricks Best Suited to? If your main purpose of playing the guitar is to learn songs then Guitar Tricks might be the one for you. 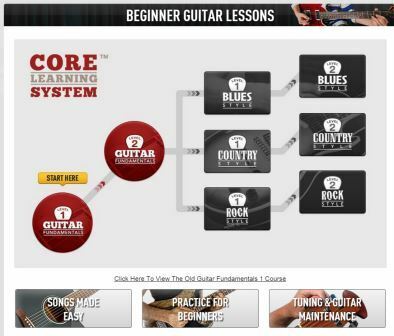 They apparently have twice as many songs to learn as any other online guitar lesson website. Assuming that’s true, that’s quite impressive. And if you are looking to learn the fundamentals, skills, techniques and knowledge necessary to be a really great guitarist then you can learn all of that at Guitar tricks from what I’ve seen. It’s pretty comprehensive and it’s all taught in an easy to learn way. Joining is beneficial for any ability level, right from the absolute beginner, those who are self-taught and want to fill in any gaps in technique they may have missed and more intermediate and advanced played too. Fundamentals 2 builds on what’s learned in fundamentals 1. It’s also broken up to separate chapters (with several lessons within each chapter). So all in all fundamentals 1 & 2 contain 62 lessons, broken up into an easy to follow and logical structure where each lesson builds on the previous one. Importantly, it’s all been designed so you learn what you need to in a particular order. The experienced lessons are broken off into a number of different areas. But begins with an introduction into a few different styles. Then you can check out some other styles (more on the styles later in this review) or go more in depth with the intro styles. Also within the advanced levels you can delve into more advanced techniques, study the styles of particular artists, learn some practice routines and practice methods and learn more chords and scales. In the experienced lessons you get. There are hundreds of lessons in the experienced lessons section – enough to keep you learning and improving for a long time. Just a little bit on the start of the experienced lessons – the introduction to styles – and then we’ll take a look at their song learning section. Once you’ve completed fundamentals two, before exploring more techniques and styles etc, there are 6 more courses that go into 3 different styles of guitar. There are level 1 and level 2 courses for each. As in all the lessons on guitar tricks, each course is broken down into several chapters and within those chapters several different lessons. I found the lessons very easy to follow and the structure made it very easy to progress through the lessons – and the progress tracker is also a really awesome feature (see below for more on that). The next area in guitar tricks is all about learning songs. There are over 700 songs in the “Learning Songs” section. What is awesome about having that many songs is that it is likely that there are a lot of songs that you will want to learn – guitar tricks apparently have twice as many song lessons as any of their competitors. This is just what they say – but I’m inclined to believe it seeing how many songs they have. And they seem to be constantly adding more too. 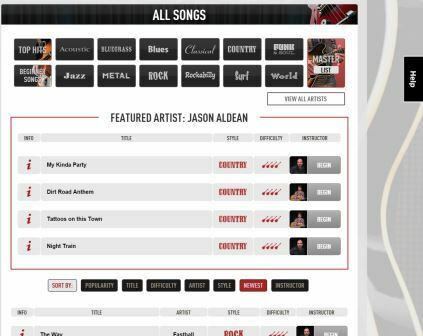 Today as I am writing this they have added 5 new song lessons over the last 12 days. Finding the right songs to learn is pretty easy with the way they’ve structured it. So you can choose the songs you learn based on difficulty (a good place to start) or search for a specific song, or learn songs from a particular artist, or from a particular genre. You might even prefer certain instructors and you can search for songs by instructor too. Until you’ve learnt how to play a song through an instructor and not trying to work it out for yourself from tablature, you won’t understand how much better this is. One of the coolest parts of guitar tricks from my perspective is their progress tracking. It may depend on the person here but, for me, having a way to track my progress through the lessons so I can easily see which lessons I’ve completed and how far through each area that I am, is awesome. For me this is super motivating and allows me to be aware that I am making progress and, even more importantly, that I am not missing anything – I know what I am yet to cover. You can see my progress tracking center to the right here. You should go through the lessons in a linear fashion so your guitar fundamentals 1 should be complete before you move onto fundamentals 2 etc. Since I was checking out lessons across the board for this review my progress looks a bit all over the place – but you get the idea. At first I really glanced over this section thinking it was just a nice bonus – and I guess it is really, but it’s also a very useful section to have. I’ll go through a few of these and explain why these are beneficial. A metronome is essentially a time keeper. This is a great tool to train you to learn to play in time. You can set the metronome at any speed you want so that you can learn something slowed down and then speed it up as you get better and want to play it faster. This is actually a pretty awesome tool. You just put in the name of the chord you want, e.g. C minor, and it will show you a fretboard diagram of how to play that chord. Not only that, it also gives you 5 different variations of how to play that chord in various positions on the fretboard. This is fantastic for any guitarist – not only for those learning songs and expanding their repertoire, but also for writing songs. The scale finder works the same way as the chord finder. You type in the scale that you want to learn, e.g. D major, and you shows you all the notes in the D major scale on the fretboard diagram, and will give you 5 different scale patterns across the fretboard. 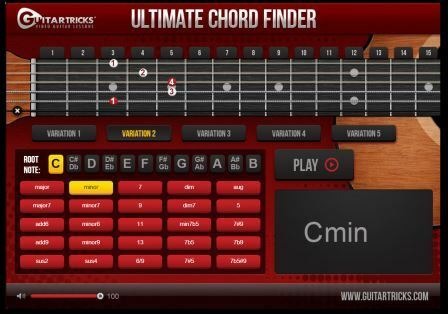 But not only that, it’s a great tool to help learn where the notes are on the fretboard. My best score from 3 attempts was 20/20 in 1:13 – the best time is 30 seconds! They must know their fretboard pretty darn well! 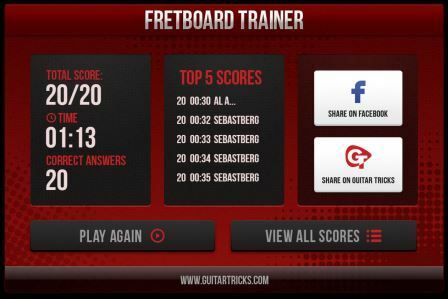 If you become a member see if you can find my score – my username is sixstring99 – and see if you can beat my time! So as you can see you get heaps of stuff here – I hope this has given you a good idea of some of what guitar tricks offers. Now let’s see how they rated in my rating system. Check out the final score in the table below and below that for details of how the rating score is broken down. There is no shortage of lessons here and from what I saw they cover every aspect you could ever ask for – in a lot of detail. Hearing that there are 11,000 lessons on guitar tricks might sound overwhelming but rest assured you won’t have to go through even a tiny fraction of those to become a really decent guitarist. It’s nice to know that there are enough lessons that you’ll never run out of material but it’s also nice to know that you won’t need to cover anywhere near close to that amount. Obviously I can’t go through each and every lesson for this review. But the lessons that I did check out were thorough, easy to understand, everything was explained very clearly, there were demonstrations and multiple camera angles. And very importantly, the lessons are structured so that you learn everything in the right order. This leads to much faster progress. GT has 32 different instructors. The great thing about multiple instructors is that you get the knowledge from several different guitarists and not just one if you were to have just a single instructor. This is one of the major advantages of online lessons over in-person lessons. The number of instructors is irrelevant if they were all crap. However, all of the instructors I saw were experienced accomplished players and, even more importantly, great teachers. I’ve seen online lessons with a greater number of instructors but it’s the quality of those instructors where it really counts and guitar tricks has that in spades from what I saw. GT has lessons for beginners, intermediate players and advanced players a-like. There are 12 different styles that they cover in depth training for and a massive amount of songs that you can learn note for note. I didn’t see much in the way of song writing – though there are certainly tools there that will help with song writing – but there could more in that area and there could perhaps be more styles covered. What styles they do cover they do it extremely well. As I mentioned above all the lessons provide all the camera angles you need to see what’s going on. In addition to this the instructors really don’t assume anything. They take you through very methodically over everything and explain things very clearly. This is really important for your motivation to continue to go through the lessons. If you enjoy them you will find it much easier and quicker to progress. All of the GT instructors I saw were all well spoken (didn’t have monotone voices or anything like that and always spoke clearly). They make the lessons interesting and interactive and the progress tracker, in my opinion, is a great tool for making the lessons more enjoyable and as a great motivator. Theory is incorporated within the lessons. Whilst not everyone wants to learn the theory side, if you do want a thorough learning experience, this is provided here. GT have a very active forum so you can chat about any number of topics with other members and GT staff. This is a great way to get answers to your questions and interact with fellow guitarists. If you can’t answer your question in the forum, you can also ask a question through a help button that is located on the right hand side of every page. I haven’t had any experience using their support but from others I’ve spoken with it sounds like it’s pretty good. Well it’s not free, so I can’t give it 5/5 but it is very reasonably priced – and you can try it out for free which is awesome because you can see if it’s for you or not before you even pay a cent. If you do decide to continue it costs $19.95 per month which is super reasonable considering that you would pay at least that for just one half hour lesson with a guitar instructor. You get access to hundreds of hours of lessons and some pretty cool tools. And if you go for a yearly membership it’s only $179 for the whole year (equivalent of $14.91 per month). If you do decide to cancel it’s really easy. You simply go to “account” and then click on “cancel billing” and you won’t be charged a cent. So I do I think it’s value for money? If you were to stay with Guitar Tricks for a year, and took advantage of what they have to offer, you would be a very capable guitarist by the end of that year. To do this it would cost you $179*. If you were to take private lessons with an in-person instructor, this would cost you anywhere from $20 to $100 per lesson. But let’s just use the minimum as an example (keeping in mind that the cheapest lessons are likely to be the worst quality). At $20 per lesson and let’s say you do 45 lessons (1 per week but you probably won’t go every single week in the year). That equals $900 for the year. And there are a bunch of reasons why in-person lessons may not necessarily make you as good a guitarist as Guitar Tricks will. In terms of the structure of the lessons and the quality of the instructors, Guitar Tricks is the best that I have seen. They are also the leaders in terms of the number of songs you can learn on there. I love the progress tracking system they use and the tools they provide are really beneficial too. The website is laid out really well and it’s super-easy to find everything you’re looking for. 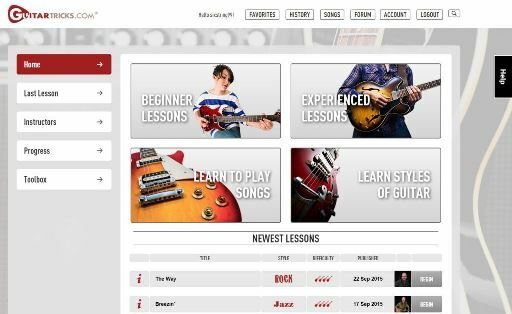 Overall this is the best online guitar lesson providers that I have come across – but that’s not a surprise really, they have been around since 1998. So they’ve had 17 years practice! If you want to check out the full access area of Guitar Tricks for yourself to see if it’s right for you check out the link below. Remember that it’s free for two weeks when you follow this link and you can cancel at any time within two weeks and not be charged anything. Thanks for reading and I hope you have found this review to be helpful. Any questions or comments are very welcome and can be left in the comments sections below. * UPDATE: Once my 2 week trial was up and I cancelled my account I received an email from Guitar Tricks offering a 1 year subscription for $99 (which is just $8.25/month). I can’t say for sure if this deal is always on or sent to everyone but but i suspect that it is, and worth a shot. Even if you sign up for a free 2 week trial and then if you receive the offer you’ll be in a better position to decide whether or not it’s for you, after trying it out for 2 weeks. Then, if it is for you, you can get it for a seriously cheap price. Those who love music and using the guitar have great guidance through your site.Nowadays most people want to learn information online.This is because it is convenient and does not restrict one from doing other business for one has to schedule every task just the way they want.I am going to refer a friend to your site to check this out. 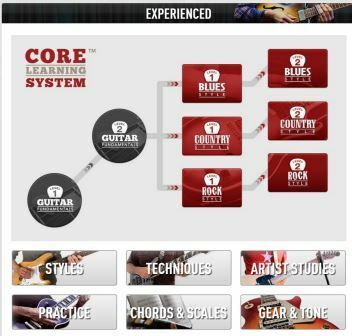 Yeah totally, online is definitely the most convenient way to learn guitar. There are still some advantages to having lessons with someone in real time but online guitar lessons are pretty darn good these days and the advantages of online lessons, in my opinion, now outweigh the benefits of in-person lessons. See more on why I think online lessons are the best option for most people (but not always) at the link below. 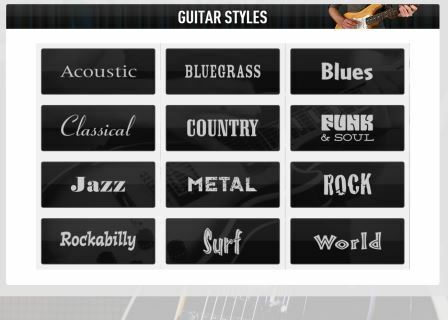 I have always wanted to learn how to play a guitar and I can now with this site. Whats great about this programs is I can try it for free for 2 weeks and pay nothing and decide if I like it. Better yet I can finally learn it at my own pace.Thank you for taking the time and writing this review. Glad you found the review helpful. 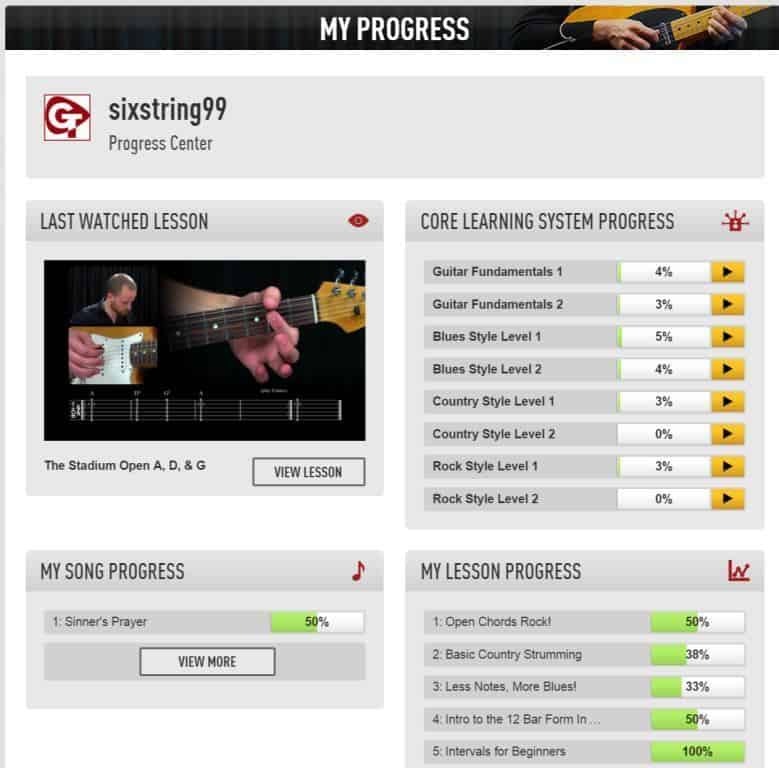 Yeah online lessons are definitely becoming more popular for learning guitar and for good reason. You’ve pointed out one of the big reasons – you can go at your own pace. I also liked the fact that Guitar Tricks does the 2 week free trial. They also have a 60 day money back guarantee I just found out. I think they keep that a little quiet – but that’s also good to know. Thanks for stopping by and good on you for taking up the guitar. Let me know if you have any more questions about getting started with the guitar. Very helpful information. I really love how you laid everything out and show us the insides of the program. We get to really see what this program has to offer. The format is easy to follow and i can stay focused on what i need to because of the great format. Thank you for the valuable information and doing a grade-A review. Have you had a chance to go and check out Guitar Tricks for yourself? If so it’d be awesome to hear what your opinion is on it. Thanks, I have joined Guitar Tricks and am on Fundamentals 2. Is it necessary to “master” each lesson? I am able to get most of the lessons down with a good understanding, be able to play it but did notice my timing is a little off so now am working the metronome. While I continue to learn and push myself forward, I am aware of things I need to go back to and still practice those as well. Do you think I am doing the right thing or am I going to see problems as I progress ( I do think I am getting better). First of all – great work joining Guitar Tricks. Having a guided plan and lessons is a huge step in your guitar progression. You’ve definitely done that right. In terms of mastering things before moving on, I am of the opinion that this is a good idea. You maybe don’t have to master each individual lesson before moving forward but I wouldn’t do more than 5-10 lessons before mastering them. What I mean by that is that you could move quickly through so many lessons but then go back through them and make sure you’ve mastered those 5 or 10 before moving onto the next lot. Awesome that you are aware of the things that you still need to go back and practice. Just make sure that the list of stuff that you need to go back to doesn’t get too big or you might either forget what you’ve got to do or you’ll feel too overwhelmed with all the things you have to go back to. Also, great job bringing in the metronome. Not enough guitarists practice with a metronome and their rhythm tends to suffer for it. So yeah, in short don’t go too far ahead, you maybe don’t have to master each and every lesson after you’ve gone through it but definitely try to get them mastered after 5-10. Of course you could try to master each lesson before moving on but some might find that a bit tedious. Great work – and best of luck with your progression!